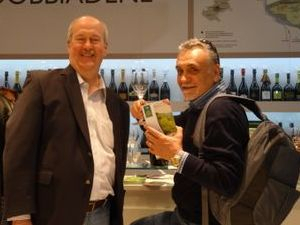 Chris Goodrich (left) and Fouad Alameddin (right) at Vin Italy sampling new wines to add to their portfolio. We're Fouad Alameddin and Chris Goodrich, friends who have known each other for years and in 2012 decided to start importing and selling our favorite wines to share. Our portfolio of wines is always evolving and expanding. We take annual trips to Italy with our wives to find new wines that we want to share with you. Our wineries stand behind the quality and love for the wine they produce. Alarich Wines focuses on the needs of our customers and our passion for wine is evident. We want to bring you wines that you will enjoy as much as we do. Click here to receive updates, we'd love to stay in touch!